The Fine Print Press, Ltd., 9781888960198, 227pp. 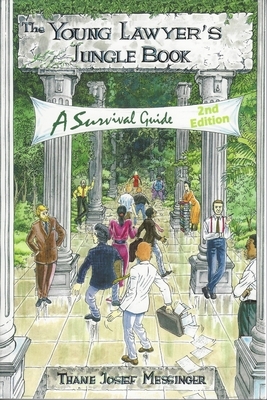 In this survival guide for the new attorney, in-depth advice on law office life, includes how to work with senior attorneys, legal research, memos, drafting, mistakes, grammar, email, workload, timesheets, reviews, teamwork, deportment, attitude, perspective, working with clients (and dissatisfied clients), working with office staff, using office tools, and, well, not just surviving but thriving in a new career. This book is written for all law graduates, for any law office: a firm—large, medium, or small—agency, corporation, or the military. Thane Messinger is an attorney, adjunct professor of business law, and author of The Young Lawyer's Jungle Book: A Survival Guide; Law School: Getting In, Getting Good, Getting the Gold; and Con Law: Avoiding...or Beating...the Scam of the Century (The Real Student's Guide to Law School and the Legal Profession). As a young associate, I was anxious to read The Young Lawyer's Jungle Book. Like most associates starting out, I have quickly realized that three years of law school education did not adequately prepare me for legal practice. While volumes have been written about law school survival and how to get ahead in law school, books on associate survival are relatively few in number. (Probably due to the lack of time young associates have for outside reading.) Thus, it was refreshing to discover that Messinger's book is primarily addressed to that forgotten class of legal society. The author offers his own tidbits and advice on everything from "your place in the firm" to dealing with other attorneys, clients, secretaries, and staff in order to avoid the traps and pitfalls that await every young "junior" in a firm. The author delivers his words of wisdom in a light-hearted and humorous manner, which makes the subject matter a little easier to digest. The book is peppered with anecdotes and humorous stories from the author's own early years as an associate. The book is loaded with common-sense advice for new associates, presented in a humorous, readable manner. Joseph Lee, Esq., Washington State Bar News, March 1997, pp. 38-39. The background Messinger provides to the new associate is priceless. Law firms might want to consider purchasing a copy for each associate. —Law Practice Management (ABA), March 1997, pp. 60-62. It has been documented many times that the first year of law practice is one of the most stressful in the life of a lawyer, replete with new surroundings, experiences, behaviors, and requirements. This book offers suggestions and survival guidelines on topics from legal research to writing style to appropriate dress to professional relationships inside and outside the firm. The author provides realistic descriptions of the time required of a new associate, the hierarchies that exist within firms, and the mysteries surrounding the annual review. This is the type of information a law student might assume is covered in law school or a CLE course or by the firm itself, but generally is not. Additionally, the book offers advice for the law student on classes, on summer jobs and judicial clerkships, and on the bar exam. A former law review editor and lawyer with a commercial practice, the author's view of the law firm environment is one more structured and "silk stockinged" than may be true for many firms today, but the background he provides to the new associate is priceless. Law firms might want to consider purchasing a copy for each associate. Law Practice Management, March 1997, pp. 60-62. Speaking primarily to new attorneys, law students, and would-be law students, though also to more senior attorneys with management and training responsibilities, the author assesses with dead-pan humor the current legal marketplace and concludes that it is less collegial and more competitive than ever before as more and more lawyers battle for the business of increasingly demanding and sophisticated clients. The author stresses that new attorneys must work hard to develop the proper attitude about the practice of law. The book not only examines such traditional orientation topics as how to work effectively with your secretary, how to organize and prioritize your work, the need to develop a proper and persuasive writing style, and the need to meet your billable target, but also more subtle, though no less important, topics that are rarely the subject of formal orientation meetings. For example, modesty, responsibly handling money, "fitting in," proper appearance, and learning to be all things to all partners all receive extensive treatment. It is in these largely subjective and too-often undiscussed areas that this book shines. Frankly confronting the reality and importance of personal and subjective preferences and prejudices in a number of non-performance aspects of firm life, the author tries to guide the young attorney over the fine line between totally compromising one's individuality and being an ego-centric individualist who compromises the firm's interests through inappropriate personal behavior. This is a thoughtful, candid, and well-written book that is simultaneously humorous, insightful, and disquieting. It honors no sacred cows, but rather attempts to provide new attorneys with honest (sometimes painfully honest) advice to guide them through the initial stage of private practice. In this the book succeeds, and the new attorney, or even second or third-year law student, would do well to make the investment. Richard F. Wareing, Esq., Connecticut Bar Journal, vol. 70, no. 4, pp. 308-310. Most junior associates are set on their way with neither map nor compass...although expected to arrive on time at the secret destination. In The Young Lawyer's Jungle Book, Thane Josef Messinger provides the map; his book is packed with frank and encouraging advice for beginning attorneys. He paints an honest picture of what is in store for a first-year associate, covering who the players are, how to behave with clients, time-billing, annual reviews, guidelines on how to act professionally as well as dress appropriately, and much, much more. The book is filled with insightful nuggets of advice that would be valuable to anyone setting off in the first years as an attorney. Messinger's advice leans toward life in the private law firm environment, but the topics discussed are relevant and general enough to interest those starting careers in other areas of legal service. This book should be suggested reading for pre-law and law students, as well as junior attorneys beginning their first years of practice. Advice is offered on which courses to take in law school, what to look for in a law firm, why a judicial clerkship can be a plus, and even tips on preparing for the bar exam. This book would also be of interest to legal recruiters, law firm administrators, personnel support, and law librarians. For those going through the transformation from law school to law practice, the demands and expectations can be overwhelming to say the least. Messinger is encouraging and supportive throughout. He genuinely wants to steer you in the right direction and to save you some agony in the long run. The Young Lawyer's Jungle Book is highly recommended for all types of law libraries. I will definitely be adding my copy to our law firm library. When one of our new fall associates saw it on my desk, he wanted to read it then and there. I wish I had enough copies for each of them. Enjoy the book! I did. Overall, I think this was a worthwhile read for a new associate in a big law firm. Mr. Messinger gives very practical advice in a no-nonsense kind of way. He tells it how it is in manner that isn't apologetic or politically correct. (It is perhaps a little male-focused as he hides a little bit from the issues when he discusses gender politics in firms or gender diversity in the profession.) By and large, I think the advice is sound and something that was worth the effort and time and would have been valuable before my summer associate job or a great read between the bar and starting work at the firm. Some things are common sense but those things likely differ for each reader.break I really appreciate that it isn't written with just litigators in mind as I've found from most of these sorts of books. He doesn't talk endlessly about cite-checking briefs of suffering through document review. I think this book would be valuable to all large and medium firm lawyers and not just litigators or transactional attorneys. You'll find practical advice and many shared lessons learned in this book. Law practice is very different from law school. Law practice is also different from most other types of jobs. Unfortunately, many new lawyers are woefully unprepared for life as a lawyer. The problems of the new lawyer are worsened by everyone's presumption of their intellect. Being smart only gets your foot in the door. It is your attitude and behavior that will keep you there. The Young Lawyer's Jungle Book is a guidebook for the new lawyer. It is also much, much more. With twelve chapters, it is loaded with over a hundred sections, covering every imaginable topic that might arise in a young career (see the Table of Contents web page, at the next stop on the Guided Tour, for a detailed listing of these sections). The Young Lawyer's Jungle Book is valuable not only because of its comprehensive discussion of the world facing the new lawyer, it is also valuable because of the author's keen sense of humor and style unusual to legal writing. The author combines his in-depth knowledge of the law, law practice, and office politics with a playful command of English. The result is an informative and humorous reference for the new lawyer. The Young Lawyer's Jungle Book is useful as both a quick guide before you start working as a lawyer, and as a reference book as you progress to partnership. With the help of this book, partnership will be a more likely reward for all of your hard work. Don't get tripped up by the hurdles that face all new lawyers. Take advantage of The Young Lawyer's Jungle Book. Messinger, Thane Josef. The Young Lawyer’s Jungle Book: A Survival Guide. 2d ed. Honolulu: Fine Print Press, 2000. 231p. Paper, $18.95. or experienced it? Messinger’s goal is to smooth the new law school graduate’s transition from academics across a chasm to the real-world practice of law. His curriculum includes thoughtful advice on professionalism such as “don’t let your personal life interfere” (p.29) and insightful discussion such as “be a good assis- tant; be likable; think ahead; anticipate what will be needed next; planning and preparation are 49% of a project; become indispensable” (p.42). Messinger is not reluctant to reveal hard truths, such as the lowly status of an associate when “on your first day of work, you are about two levels above amoebae” (p.53) who should “not make the mistake of assuming you’ll be told what to do” (p.70). ¶55 Messinger’s survey of learning law practice is comprehensive. He describes typical law personalities (the academic, the bully, the bureaucrat, the industrialist, the perfectionist, the pinhead, and more) and suggests how to deal with them. He covers the basics of office conduct and practice (bookkeeping, use of proper grammar and plain English, hierarchy in the firm, hygiene, continuing education, clients), but addresses as well such advanced topics as the yearly review, group outings, office decoration, pro bono work, and extracurricular activ- ities (i.e., participating in nonprofit organizations or publishing articles). Although the legal field is dominated by white men, the author involves all demographics in his discussion as well, including advice on dealing with secretaries, support staff, librarians (hear! hear!) (in sum, “don’t be snotty” (p.183), “be nice” (p.193)), and how minority and gender issues fit in. ¶56 Messinger provides some guidance on where to pursue practice area interests. If the graduate wants “courtroom experience, run—don’t walk—to the nearest District Attorney or Public Defender’s office” (p.49). Its humorous bent makes this book fairly entertaining as well as informative: “If you like being around wealthy people, go for the big firms. If you really like being around wealthy people, get off on the estate-planning floor” (p.49). In developing a field of specialty, the novice lawyer needs to assertively express interest in an estab- lished attorney and his or her work. ¶57 Messinger is disappointed that his book has not made inroads into law schools and law firms to help new associates become more successful and, at the same time, help firms become more profitable with less attrition. But can such a heretical work be sanctioned, even welcomed, by the overstuffed egos well known in every law office? Would they admit that “your reputation is pretty much all you have in law” (p.209)? Do they want law school students to know that at work they are “supposed to be an invisible profit center” (p.29)? Can the legal profession accept such a blunt internal evaluation of the realities without destroying itself? This books walks a fine line, attempting to balance the author’s values with the behavior necessary to survive in law office fiefdoms. the countless parentheticals, ellipses, and silly footnotes soon become tiresome. However, the virtues of the book outweigh this fault. ¶60 Having expended a great deal of ranting, insight and humor to compen- sate for the failure of law schools to prepare graduates for real world law practice, we thus come full circle to academic ponderings, with the author not only pro- viding a good deal of concrete advice, but also offering provocative ideas on intriguing issues relating to the place of law in society. I look forward to the evo- lution of Thane Josef Messinger as an author. I agree with Messinger's thesis that both new attorneys and their new employers are unprepared for this journey. New associates are often bewildered by the world after law school, with its competing demands on too little time, uncommunicated or confusing expectations by supervisors and clients, and isolation into piecemeal projects having little perceived relevance to the reality of lawyering. Similarly, law firms are notorious for their inability -- through lack of time, attention, expertise, or awareness -- to develop a coherent and meaningful plan to train and develop their new attorneys, which are their greatest resource and their future. Today's green attorney is tomorrow's senior partner, and both parties need to get about the business of this transformation -- it is in the best interest of the firm, the attorneys, and, most importantly, the clients they serve. After twenty-four years of practicing law...I try to recall the professional, intellectual, and social paralysis (borne largely of fear and intimidation) I suffered as a new associate. I can still conjure those old demons. I just hoped that the profession had moved on, or that collegiality and professionalism had replaced some of the feudal aspects of the practice at its worst. But, if this is the way the world is, then Messinger's book captures its essence and probably rings true to law school graduates thrust into the breach. It may make a great graduation present. Catherine A.G. Sparkman, Esq., The Colorado Lawyer, vol. 26, no. 12, pp. 26-28. This book focuses much more on the "feel" of law. That is, how you are expected to think and feel and what those around you are thinking and feeling, including partners. Recognize that knowing the unstated motivations of a senior partner can sometimes help you react in a more advantageus way - and that the partner's motivations are often different from what you have been told to expect and are often not at all transparent. This can be especially useful in practice because no matter how big the checklist, at some point you will have to start winging it - and you really can't wing it effectively unless you know what motivates people and what they expect of you. This book was written in 1999, and also sometimes feels a little dated, but here the dated-ness has a minimal impact on the underlying feeling. For example, the fact that somone would be talking to their friends on Facebook rather than on the phone is a technological difference between 1999 and 2009, but how that person feels is pretty much the same. Also, what they want to feel from you is also pretty much the same.